KINGSTON: Offshore oil exploration, more supply of liquefied natural gas and major construction works in Jamaica are among the potential major deals clinched by Prime Minister Datuk Seri Abdullah Ahmad Badawi during his two-day visit here. The Caribbean country agreed to petroleum exploration with Petronas in the face of increasing energy costs it faced. It also agreed to carry out follow-up talks with Malaysia following Abdullah’s interest in providing construction services to Jamaica, particularly in the area of low-cost housing. Abdullah said Malaysia had worked well with Jamaica in building a 230km highway project linking the capital Kingston with Montego Bay, the tourist beach belt. “We hope other Malaysian companies will have opportunities to participate in the development of Jamaica’s economy especially in the tourism industry, road construction, housing and other infrastructure development,” he said at an official dinner hosted by his counterpart Portia Simpson Miller here on Tuesday. During bilateral talks earlier, the Jamaican Prime Minister said opportunities had also been identified in sports and agriculture. Simpson Miller said she and Abdullah attached importance to sports, adding that the areas to be improved included track and field, netball, and badminton – which Malaysia excelled in. 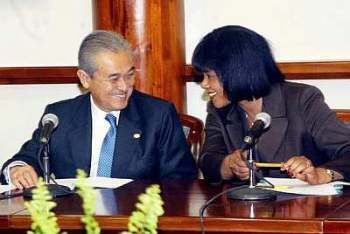 Abdullah said Malaysia also explored the possibility of getting nurses to be trained in Jamaica. Malaysia has also sought places at the medical faculty of Jamaica’s University of West Indies. Its medical degrees are recognised by the Malaysian Medical Council. The two leaders, in a joint statement, said both sides had agreed to expedite the conclusion of a memorandum of understanding on cooperation in education. In the field of agriculture, they agreed that Jamaica could benefit from collaboration with Malaysia in the area of coconut growing, especially in fighting the lethal yellowing disease on coconut trees. Abdullah also said Malaysia could be the gateway to Asean, with a combined population of over 500 million people, while Jamaica could become the hub for Malaysian exports to the Caribbean. Abdullah was accompanied by Works Minister Datuk Seri S.Samy Vellu, Higher Education Minister Datuk Mustapha Mohamed, and, Youth and Sports Minister Datuk Azalina Othman. Yesterday, Abdullah met Governor-General Prof Kenneth Hall and Opposition Leader Bruce Golding before making a tour of the highway, known as Highway 2000. He also met Jamaican businessmen for lunch. Abdullah then left for Texas, United States, where he would attend an international conference on biotechnology.